Klebsiella pneumoniae (K. pneumoniae) is Gram-negative, rod-shaped, facultative anaerobic, and nonmotile bacterium, belongs to family Enterobacteriaceae. It is a common human pathogen associated with nosocomial and community infections . K. pneumoniae isolates causes several infections such as pneumonia, septicemia, wound infections, and urinary tract infections, which ultimately lead to morbidity and mortality especially in immunocompromised patients, and patients of intensive care units, pediatrics and surgical wards . K. pneumoniae acquire resistance against existing antimicrobials by multiple mechanism results in increased multidrug-resistant (MDR) of K. pneumoniae that leads to serious problem in hospital settings and health concern. Emergence of resistance occurs not only in MDR isolates but also exist in pan-drug resistant (PDR) isolates of K. pneumoniae. PDR refers to the resistant strains those are specifically resistant to 7 antimicrobial agents such as cefepime, imipenem, meropenem, ceftazidime, ciprofloxacin, piperacillin-tazobactam, and levofloxacin . Apart from this, the extended-spectrum β-lactamase (ESBL) producing Klebsiella from a patient has been identified which causes serious threat worldwide [4,5]. Continuous use of antibiotics leads to resistance in microorganisms via. different pathways mediated by plasmids, transposons, and gene cassettes in integrons [6,7]. Carbapenem is usually preferred for the infection caused by MDR isolates of K. pneumoniae but recently carbapenem-resistant K. pneumoniae was also reported . Due to dramatically increase in drug resistant in K. pneumoniae, very few treatment options are available. Alternative approaches are available but altering the sensitivity pattern of antimicrobials using biofield is not available against MDR microorganism, apart from existing allopathic system of medicine. Biofield treatment may be an alternative approach to alter the susceptibility pattern of K. pneumoniae. Complementary and alternative medicine (CAM) therapies are commonly practiced in healthcare sector and about 36% of Americans regularly uses some form of CAM . CAM include numerous energy therapies, biofield therapy, is one of the energy medicine widely used worldwide to improve the human health. The energy exists in various forms that can be produced from different sources such as potential, electrical, kinetic, magnetic, and nuclear energy. However, electromagnetic field defines as when electrical signals fluctuate will generate magnetic field with respect to time. The cumulative effect of bio-magnetic and electric field that surrounds the human body is defined as biofield. The biofield energy can be monitored by using electromyography (EMG), electrocardiography (ECG) and electroencephalogram (EEG) . According to Lucchetti et al. biofield energy has shown significant effect on growth of bacterial cultures . Mr. Trivedi has the ability to harness the energy from environment or universe and can transmit into any living or nonliving object(s) around the Universe. The objects always receive the energy and responding into useful way via biofield energy and the process is known as biofield treatment. Mr. Trivedi’s unique biofield treatment is also known as The Trivedi Effect®. Mr. Trivedi’s biofield treatment was extensively studied in different fields such as in material science [12,13], agricultural science [14-16], and in biotechnology . Further, the biofield treatment has considerably altered the susceptibility of antimicrobials and biotype of microbes [18-20]. By considering the above mentioned facts and literature reports on biofield treatment, the present work was undertaken to evaluate the impact of biofield treatment on antimicrobials susceptibility, biochemical reactions pattern, and biotype of MDR isolates of K. pneumoniae. MDR clinical lab isolates (i.e. LS 2, LS 6, LS 7 and LS 14) of K. pneumoniae were obtained from stored stock cultures in Microbiology Lab, Hinduja Hospital, Mumbai. Each MDR strains was divided into two groups i.e. control and treatment. The acceptability of the identification media and antimicrobial agents were checked prior to the study on microorganisms. The antimicrobial susceptibility, biochemical reactions, and biotype number were evaluated on MicroScan Walk-Away® (Dade Behring Inc., West Sacramento, CA) using Negative Breakpoint Combo 30 (NBPC 30) panel. The NBPC 30 panel was stored at 2 to -25ºC. All antimicrobials and biochemicals were procured from Sigma Aldrich, USA. Treatment groups of each strain, in sealed pack were handed over to Mr. Trivedi for biofield treatment under laboratory conditions. Mr. Trivedi provided the treatment through his energy transmission process to the treated groups without touching the samples. The biofield treated samples were returned in the similar sealed condition and analyzed on day 10 using the standard protocols. The study was conducted on automated MicroScan Walk-Away® system (Dade Behring Inc., USA). Biochemical studies of each MDR isolates of K. pneumoniae were determined by MicroScan Walk-Away® using NBPC 30 panel system in both control and treated groups. Biochemicals used in the study are acetamide, adonitol, arabinose, arginine, cetrimide, cephalothin, citrate, colistin, esculin hydrolysis, nitrofurantoin, glucose, hydrogen sulfide, indole, inositol, kanamycin, lysine, malonate, melibiose, nitrate, oxidation-fermentation, galactosidase, ornithine, oxidase, penicillin, raffinose, rhamnose, sorbitol, sucrose, tartarate, tryptophan deaminase, tobramycin, urea, and Voges-Proskauer . The biotype number of each MDR isolates of K. pneumoniae in control and treated sample were determined followed by identification of microorganism by MicroScan Walk-Away® processed panel data report with the help of biochemical reaction data . 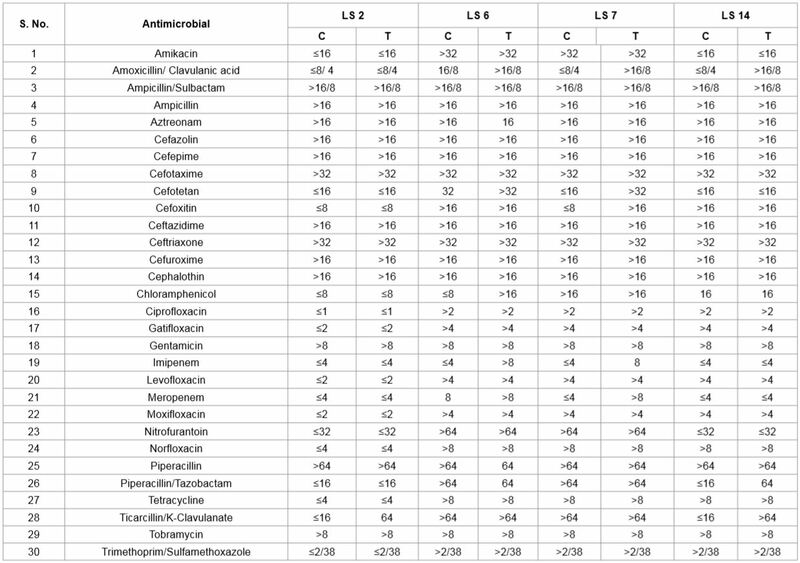 Results of antimicrobial sensitivity pattern and MIC values of control and treated MDR isolates of K. pneumoniae are summarized in Tables 1 and 2, respectively. All these changes were observed on 10 days after biofield treatment as compared to control group. Overall, 46.42% of tested antimicrobials out of twenty eight, showed alteration in antimicrobial sensitivity pattern against biofield treated MDR isolates of K. pneumoniae. All four MDR isolates, showed variations in antimicrobial sensitivity assay viz. 32.14% in LS 2, 25% in LS 6, 17.85% in LS 7, and 28.57% in LS 14 against the tested antimicrobials (Figure 1). Extended spectrum beta-lactamases (ESBLs) are rapidly evolved group of beta-lactamases enzyme, which confer resistance to most beta-lactam antibiotics, including penicillins, cephalosporins, monobactam and aztreonam. Apart from beta-lactam antibiotics, ESBLs are also resistant to other classes of non-penicillin antibiotics . Beta-lactamases are enzymes that inactivates the antibiotic and are present in almost all Gram-negative bacilli. However, some pathogenic species, such as E. coli and Klebsiella spp., are not able to induce the production of β-lactamase which varies from low to high level. In some species, exposure to β-lactams will induced the production level of β-lactamase, commonly results in resistance to these agents. These inducible β-lactamases are frequently found in Enterobacter spp. . Experimental results of antimicrobial sensitivity assay showed altered sensitivity pattern in biofield treated clinical isolates of K. pneumonia. Aztreonam, cefotaxime, ceftazidime, and ceftriaxone sensitivity changed from EBL → R in LS 2 and LS 14. Sensitivity of amoxicillin/k-clavulanate changed from S → R in LS 7 and LS 14, while S → IB and I → R in LS 2 and LS 6 respectively. Cefotetan and cefoxitin found changed sensitivity pattern from S → R in LS 7, and while S → IB in LS 2. Sensitivity of cefotetan changed from I → R in LS 6 while S → IB in LS 14. Chloramphenicol and imipenem sensitivity changed from S → R in LS 6. Although, in imipenem sensitivity changed from S → I in LS 6. Meropenem sensitivity changed from I → R and S → R in LS 6 and LS 7 respectively. An increase in sensitivity was reported in piperacillin/tazobactam and piperacillin i.e. from R → I in biofield treated LS 6 as compared to control. Although, piperacillin/tazobactam sensitivity changed from S → IB and S → I in LS 2 and LS 14 respectively. 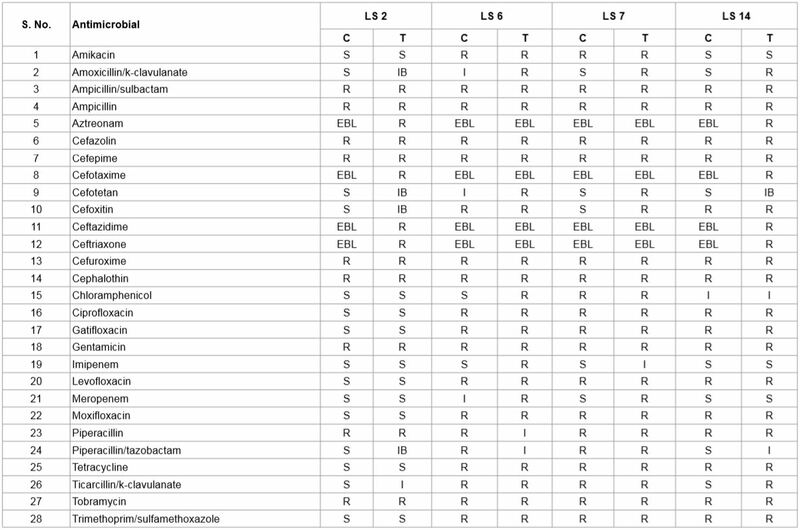 Ticarcillin/K-clavulanate sensitivity altered from S → I and S → R in LS 2 and LS 14 respectively (Table 1). Rest of antimicrobials did not show any change in sensitivity pattern after biofield treatment. Table 1: Effect of biofield treatment on multidrug resistant lab isolates of Klebsiella pneumoniae to antimicrobial susceptibility. against K. pneumoniae infections preferably uses cefoperazone/sulbactam, piperacillin/tazobactam, and imipenem antimicrobials . Although, piperacillin/tazobactam antimicrobial agent is useful and preferred in neonatal infections caused due to K. pneumoniae . Biofield treatment in clinical isolate (LS 6) significantly increased the sensitivity and decreased the MIC values of piperacillin/tazobactam and piperacillin. In Enterobacteriaceae family, the most prevalent mechanism of acquired resistance in β-lactam antibiotics (piperacillin/tazobactam and piperacillin) are the production of β-lactamases . Biofield treatment might act on enzymatic or genetic level which might affects the β-lactamases production that may lead to alter the sensitivity pattern of tested antimicrobials. 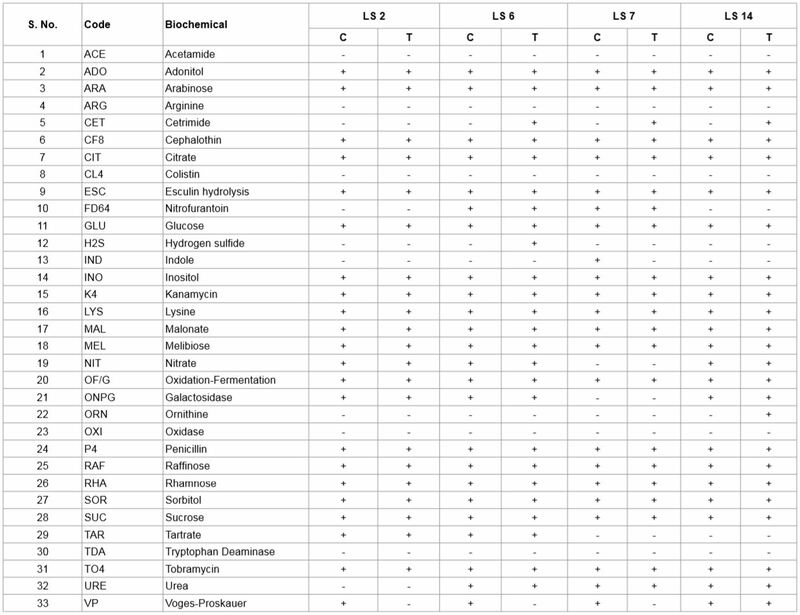 Biochemical study results of control and biofield treated groups are summarized in Table 3 and Figure 1. Results showed that overall 15.15% change in tested biochemical reactions among 4 treated MDR clinical isolates of K. pneumoniae as compared to control. Cetrimide changed from (-) negative to (+) positive reaction in LS 6, LS 7, and LS 14 as compared to control. Voges-Proskauer changed from (+) positive to (-) negative reaction in LS 2, LS 6, and LS 7. Indole changed from (+) positive to (-) negative reaction in LS 7. Ornithine changed from negative (-) to positive (+) reaction in LS 14. Rest of biochemicals did not show any alteration in their reaction after biofield treatment. Voges-Proskauer, citrate, arabinose, lysine, glucose, sucrose, malonate are the standard positive reaction biochemical tests of K. pneumoniae while hydrogen sulfide, indole, ornithine and cetrimide are the standard negative reaction test. Biochemical reactions of control MDR isolates of K. pneumoniae were well supported with literature data . Based on the biochemical results, significant alteration in biotype numbers were observed in all the four biofield treated lab isolates i.e. LS 2, LS 6, LS 7, and LS 14 as compared to control. New organism was identified as Enterobacter aerogenes in LS 2 and LS 14 after biofield treatment on day 10 with respect to control (Table 4). Biofield treatment as an alternate and complementary medicine, increasingly used in biomedical health care system such as reduction in pain and anxiety . However, National Center for Complementary and Alternative Medicine/National Institute of Health (NCCAM/NIH), now defined biofield therapies in subcategory of energy therapies as one of the five complementary medicine domain . Mr. Trivedi’s biofield treatment in pathogenic microbes were extensively studied and had shown significant alteration in the antimicrobial sensitivity pattern, biochemical reactions, and biotype number [18,19]. Biofield treatment might be responsible to do alteration in microorganism at genetic level and/or enzymatic level, which may act on receptor protein. While altering receptor protein, ligand-receptor/protein interactions may also alter that could lead to show different phenotypic characteristics. Hence a cascade of intra-cellular signals may be initiated, accelerated or inhibited . The overall observations showed that, biofield treatment on MDR isolates of K. pneumoniae induced significant alteration in antimicrobial susceptibility pattern, MIC values, biochemical reactions, and biotype number. Table 2: Minimum inhibitory concentration (MIC) of multidrug resistant lab isolates of Klebsiella pneumoniae. Table 3: Effect of biofield treatment on multidrug resistant lab isolates of Klebsiella pneumoniae to the vital processes occurring in living organisms. Overall data conclude that there has a significant impact of biofield treatment on antimicrobial susceptibility pattern, MIC values, biochemical reactions, and biotype number in all the four clinical MDR lab isolates of K. pneumoniae. Based on the study outcome, biofield treatment could be applied to alter the sensitivity pattern of antimicrobials, against multi-drug resistance isolates of K. pneumoniae. Authors gratefully acknowledged the whole team of PD Hinduja National Hospital and MRC, Mumbai, Microbiology Lab for conducting experimental studies. Authors would also thankful to Trivedi Science™, Trivedi Master Wellness™ and Trivedi Testimonials for their generous support in experimental works. 2. Ben-Hamouda T, Foulon T, Ben-Cheikh-Masmoudi A, Fendri C, Belhadj O, et al. (2003) Molecular epidemiology of an outbreak of multiresistant Klebsiella pneumoniae in a Tunisian neonatal ward. J Med Microbiol 52: 427-433. 3. Falagas ME, Karageorgopoulos DE (2008) Pandrug resistance (PDR), extensive drug resistance (XDR), and multidrug resistance (MDR) among Gram-negative bacilli: need for international harmonization in terminology. Clin Infect Dis 46: 1121-1122. 4. Jarlier V, Nicolas-Chanoine MH, Fournier G, Philippon A (1988) Extended-broad spectrum ß-lactamases conferring transferable resistance to newer ß-lactam agents in Enterobacteriaceae: Hospital prevalence and susceptibility patterns. Rev Infect Dis 10: 867-878. 5. Romero ED, Padilla TP, Hernández AH, Grande RP, Vázquez MF, et al. (2007) Prevalence of clinical isolates of Escherichia coli and Klebsiella spp. producing multiple extended-spectrum beta-lactamases. Diagn Microbiol Infect Dis 59: 433-437. 6. Kang HY, Jeong YS, Oh JY, Tae SH, Choi CH, et al. (2005) Characterization of antimicrobial resistance and class 1 integrons found in Escherichia coli isolates from humans and animals in Korea. J Antimicrob Chemother 55: 639-644. 7. Stalder T, Barraud O, Casellas M, Dagot C, Ploy MC (2012) Integron involvement in environmental spread of antibiotic resistance. Front Microbiol 3: 119. 8. Nordmann P, Cuzon G, Naas T (2009) The real threat of Klebsiella pneumoniae carbapenemase-producing bacteria. Lancet Infect Dis 9: 228-236. 9. Barnes PM, Powell-Griner E, McFann K, Nahin RL (2004) Complementary and alternative medicine use among adults: United States, 2002. Adv Data : 1-19. 11. Lucchetti G, de Oliveira RF, Gonçalves JP, Ueda SM, Mimica LM, et al. (2013) Effect of Spiritist “passe” (Spiritual healing) on growth of bacterial cultures. Complement Ther Med 21: 627-632. 12. Dabhade VV, Tallapragada RR, Trivedi MK (2009) Effect of external energy on atomic, crystalline and powder characteristics of antimony and bismuth powders. Bull Mater Sci 32: 471-479. 13. Trivedi MK, Tallapragada RR (2009) Effect of superconsciousness external energy on atomic, crystalline and powder characteristics of carbon allotrope powders. Mater Res Innov 13: 473-480. 16. Lenssen AW (2013) Biofield and fungicide seed treatment influences on soybean productivity, seed quality and weed community. Agricultural Journal 8: 138-143. 19. Trivedi MK, Patil S (2008) Impact of an external energy on Yersinia enterocolitica [ATCC-23715] in relation to antibiotic susceptibility and biochemical reactions: An experimental study. Internet J Alternat Med 6: 13. 20. Trivedi MK, Bhardwaj Y, Patil S, Shettigar H, Bulbule A (2009) Impact of an external energy on Enterococcus faecalis [ATCC-51299] in relation to antibiotic susceptibility and biochemical reactions-An experimental study. J Accord Integr Med 5: 119-130. 22. Paterson DL, Bonomo RA (2005) Extended-spectrum beta-lactamases: a clinical update. Clin Microbiol Rev 18: 657-686. 23. Jones RN, Baquero F, Privitera G, Inoue M, Wiedemann B (1997) Inducible ß-lactamase-mediated resistance to third-generation cephalosporins. Clin Microbiol Infect 3: 7-20. 24. Abdullah FE, Mushtaq A, Irshad M, Rauf H, Afzal N, et al. (2013) Current efficacy of antibiotics against Klebsiella isolates from urine samples - a multi-centric experience in Karachi. Pak J Pharm Sci 26: 11-15. 25. Pillay T, Pillay DG, Adhikari M, Sturm AW (1998) Piperacillin/tazobactam in the treatment of Klebsiella pneumoniae infections in neonates. Am J Perinatol 15: 47-51. 26. Lee J, Oh CE, Choi EH, Lee HJ (2013) The impact of the increased use of piperacillin/tazobactam on the selection of antibiotic resistance among invasive Escherichia coli and Klebsiella pneumoniae isolates. Int J Infect Dis 17: e638-643. 27. Hansen DS, Aucken HM, Abiola T, Podschun R (2004) Recommended test panel for differentiation of Klebsiella species on the basis of a trilateral interlaboratory evaluation of 18 biochemical tests. J Clin Microbiol 42: 3665-3669. 28. Turner JG, Clark AJ, Gauthier DK, Williams M (1998) The effect of therapeutic touch on pain and anxiety in burn patients. J Adv Nurs 28: 10-20. 29. Koithan M (2009) Introducing Complementary and Alternative Therapies. J Nurse Pract 5: 18-20. 30. Hintz KJ, Yount GL, Kadar I, Schwartz G, Hammerschlag R, et al. (2003) Bioenergy definitions and research guidelines. Altern Ther Health Med 9: A13-30.